Here we are going to see, how to find area of quadrilateral with vertices. 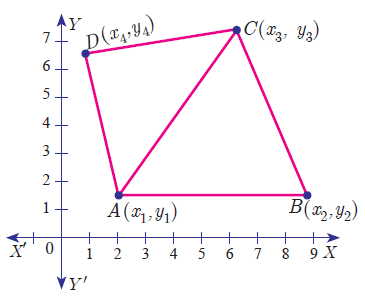 To find the area of the quadrilateral with the given four vertices, we may use the formula given below. By taking the points in counter clock wise, we have to find the area of CABD. By taking the points in counter clock wise direction, we find the area of BADC. Hence the value of k is -5. 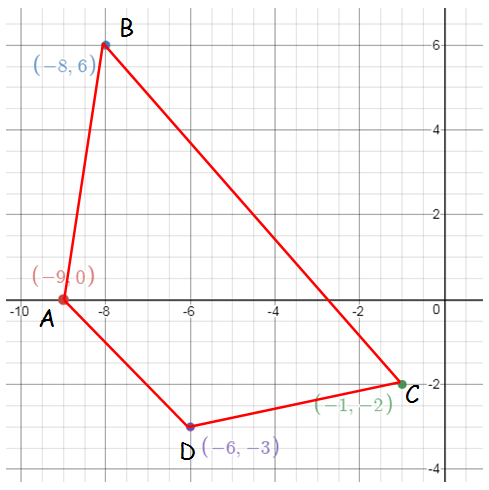 If the points A(-3, 9) , B(a, b) and C(4, -5) are collinear and if a + b = 1 , then find a and b. After having gone through the stuff given above, we hope that the students would have understood, "Find Area of Quadrilateral with Vertices". 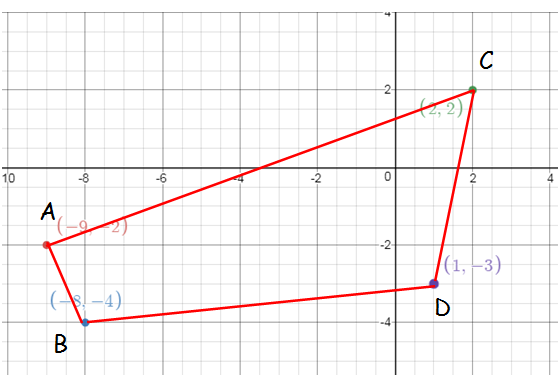 Apart from the stuff given in this section "Find Area of Quadrilateral with Vertices", if you need any other stuff in math, please use our google custom search here.